Look carefully on every gravestone and you will discover something that each one has in common. That common factor is not found in the names and dates engraved into the stones. It is not the size and shape of the headstone. There is only one characteristic common to all gravestones: the dash. It is strategically located between the date of birth and the date of death. That simple dash has a profound and symbolic meaning. It represents the entirety of a person&#x2019;s life. All the events that take place during a person&#x2019;s lifetime, from the day a person exits the mother&#x2019;s womb to the day he enters eternity, are fully represented in that single dash. If you are reading this, your dash is not yet complete. How will you live the remainder of your dash? Will your dash represent something significant and worthy, or will it mean something else? 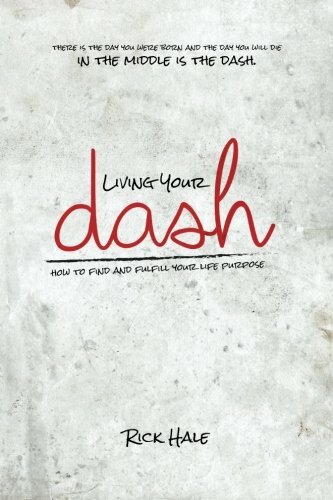 Living Your Dash is a journey into the discovery of our life mission. Guiding us on this journey is a man named Nehemiah, a cupbearer by trade, but called by God to be something much more. Challenged with building a wall around the city of Jerusalem, this ordinary man goes on a mission to find and fulfill his God-given, God-ordained purpose. The Old Testament book of Nehemiah reads like a private journal. Through the experiences of a simple cupbearer, we can learn the step-by-step process of finding and fulfilling our life purpose. Rick Hale is the Senior Pastor of Grace Community Church, an interdenominational church with a vision of helping people discover God&#x2019;s purpose for their lives. He has been a pastor since 1977, serving in various leadership positions. He is also involved with Community Bible Study where he is the local Teaching Director. In addition, he serves as the National Director of Conference Development for Community Bible Study and is a regular speaker at the organization&#x2019;s National Leadership Conferences where his messages impact the lives of thousands of people. In 1980, he began a Thursday Noontime Bible Study which has become a mainstay in the community, deepening the faith of business leaders, retirees, and lunch-hour attendees for more than 30 years. He was educated at Abilene Christian University where he earned both Bachelor&#x2019;s and Master&#x2019;s degrees in Ministry. He is married to his wife Mary. They have two grown children.